Delegates to IPI’s World Congress discussed African media problems. 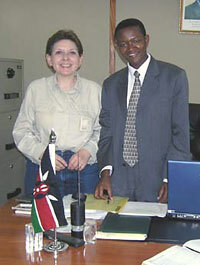 Visit with Kenyan government spokesman Dr. Alfred Mutua in his office. Congress opening at Kenyatta International Conference Center’s amphitheater in Nairobi. IPI Chairman Wilfred Kiboro, Rwandan President Paul Kagame, Kenyan President Mwai Kibaki, the Aga Khan and IPI Director Johann Fritz. Abu-Fadil at Bomas of Kenya cultural center outside Nairobi, with new friend. Prof. Thomas Baeur, Head, Department of Audiovisual Media and Media Culture, Institute for Communication and Media Studies, University of Vienna with Massai tribespeople at IPI World Congress. The Institute for Professional Journalists’ director joined experts from around the world to call for greater press freedom, protection of confidential sources of information, fairer portrayal of Muslims and Arabs, and, introduction of self-regulatory mechanisms to enhance news reporting and ethical standards for journalists. IPJ’s Magda Abu-Fadil spoke during a panel entitled “Reporting on the Islamic World” (PDF) at the International Press Institute’s World Congress and 54th General Assembly in Nairobi. She provided delegates with a PowerPoint presentation on how Western media have generally failed to cover Arab and Muslim affairs with balance, fairness and impartiality. “What worries me is the editorializing, pseudo-expert pontificating by TV ‘talking heads’ and so-called reporting by journalists covering a region about which they know very little and don’t have the time or desire to learn about,” she said. She called on the media to rethink their coverage of Islam and the Arabs, saying it was not not just good public relations but good business and that responsible journalism could go a long way towards minimizing the artificially juiced-up clash of civilizations. 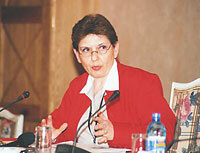 Abu-Fadil was one of over 400 editors, media executives and leading journalists from 55 countries who gathered in Nairobi May 21–24, 2005 for the four-day event that featured lively panel discussions on Africa, press freedom, and the media industry. The panel on Islam included Hajiya Bilkisu, the editor of Citizen Communications, Kaduna, Nigeria; Semih Idiz, diplomatic editor of CNN Türk and a columnist for the Istanbul daily Milliyet; and Shams Vellani, director of special projects for the Aga Khan Development Network in London, who were equally critical of how Muslims were portrayed in Western media. Panelist Alisha Ryu, the Voice of America’s Nairobi Bureau Chief, admitted that correspondents are often parachuted into countries or situations about which they had scant knowledge, but said they were also frequently ill prepared or equipped by their news organizations, or had little time to analyze stories adequately. While diplomats are trained and given background information on their missions abroad, journalists were just sent on assignments, she explained. IPI members at the World Congress adopted resolutions urging funding for public broadcasting, free of political and economic pressures; a halt to governments’ attempts to uncover confidential sources; the creation of greater awareness about the need for media ethics and self-examination; and criticized restrictive laws hampering journalists in their search for information. “Journalism has parallel functions to justice, among others, to inform the citizenry — including government officials of the condition and concerns of societies, to uncover abuses or betrayals of public trust, and to provide opinion, comment, and analysis, as well as platforms for debate,” the document said. IPI Chairman Wilfred D. Kiboro, Group Chief Executive Officer of the Nation Media Group, Ltd., had welcomed delegates to the opening ceremony at the Kenyatta International Conference Center’s amphitheater in central Nairobi, followed by IPI Director Johann Fritz. Prominent speakers included Kenyan President Mwai Kibaki, Rwandan President Paul Kagame and the Aga Khan. The congress’ deliberations took place at Nairobi’s Intercontinental Hotel. IPI also honored Zimbabwan SW Radio Africa with its 2005 Free Media Pioneer Award during the World Congress. The radio’s veteran founder and manager Gerry Jackson has been operating out of a London studio with exiled reporters and DJs. She was fired from the Zimbabwe Broadcasting Corporation’s Radio 3 music station after defying orders and airing live telephone calls from people on the scene during food riots in Harare in 1997. Vice President Moody Awori of Kenya delivered the conference’s closing remarks.